Tani vs. FunMasterMike -- he insisted on playing Black both games! Photo: John Brezina. 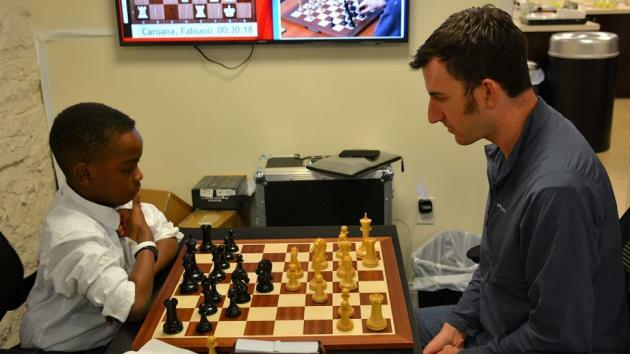 In case you haven't heard by now, the sensational 8-year-old talent Tanitoluwa "Tani" Adewumi is pretty good at chess. Although he's only been playing for about one year, and despite being homeless and a refugee from Nigeria, he recently won the K-3 Championship for all of New York. After his story was published in the New York Times, Tani's journey has been chronicled in many other newspaper and television stories. Luckily, a fundraising effort raised more than $200,000 for Tani and his family and an anonymous donor paid one year's rent for an apartment in New York City. They gave most of the money to other African immigrant families through the newly-created Tanitoluwa Adewumi Foundation. Tani goes to PS 116 in Manhattan and is quickly becoming a master at interviews too! Photo: FunMasterMike. Tani visited the Saint Louis Chess Club recently and got to play a host of famous chess players, including new U.S. Women's Champion (and former ChessKid!) Jennifer Yu, world championship runner-up Fabiano Caruana, and the man who won the event, 5-time U.S. Champion Hikaru Nakamura! Tani vs. the legendary Hikaru Nakamura. Photo: FunMasterMike. Tani vs. Hikaru Nakamura. Black to play. Is ...Nxe4 a playable tactic here? Tani will let you know soon in his ChessKid video! And here's Tani's full game video against 17-year-old U.S. Women's Champion Jennifer Yu, who once played in the CONIC tournament on ChessKid! And finally, Tani played FunMasterMike in two blitz games! Tani in full focus. He played a ton of ChessKid puzzles to learn the tactics of the game. Photo: John Brezina. Want to know how the two games went with Tani? You'll have to wait for the full analysis videos, to be released soon. Good luck to Tani and the ChessKid team will be following your career and your inspirational story as you continue on your journey to grandmaster.